Dental emergencies can have serious consequences, both for your teeth and for your general health, so it’s important to take them seriously. Depending on your symptoms, you may need to see a dentist immediately or within the next few days. What is a dental emergency? A dental emergency is defined as an oral health issue that requires immediate treatment in order to save a tooth, control an infection or alleviate pain. How can I tell if something is a dental emergency? Not sure if you’re dealing with a dental emergency? Check our alphabetical list of symptoms to determine what it might be. How can I tell if a dental emergency is urgent? As a rule of thumb, if you have swelling, extreme pain or bleeding, you should seek immediate treatment, either from a dentist or a hospital emergency room. You should also seek immediate treatment for a knocked-out tooth, as it may be possible to save the tooth. You should not take over-the-counter medication for more than a couple of days without a diagnosis. What should I do to prepare for a visit to an emergency dentist? In most cases, you should rinse your mouth with saltwater and avoid chewing on the affected side. If you have pain, you can also take an anti-inflammatory such as Advil, unless you are allergic. What will the emergency dentist do? The precise treatment will depend on the diagnosis, but every visit to an emergency dentist will start with a consultation, which includes a questionnaire, a dental and medical history, and any appropriate x-rays. Treatment may include painkillers, antibiotics, fillings, and/or repair of dental work such as crowns or veneers. Treatment may also include an emergency root canal or a tooth extraction. What it might be: Bad breath is often caused by gum disease, which in turn is usually due to poor oral hygiene. Bad breath can also be caused by dry mouth, which may be a side effect of medication. There are many other health conditions that can cause bad breath, including tooth decay (cavities), sinus infections and digestive issues. What you should do: Drink fluids, rinse your mouth with saltwater, and see a dentist. To avoid bad breath in the future, you should practice good oral hygiene (brushing and flossing). What it might be: Bleeding in the mouth may be the result of a recent dental procedure, such as a tooth extraction, or external trauma. Bleeding gums might be caused by a gum abscess or gum disease. What you should do: If you have extensive bleeding, you should immediately go to the hospital emergency room. If you have slight bleeding following a tooth extraction, you can apply a tea bag to the extraction site. If you have bleeding gums, you should rinse your mouth with saltwater and see a dentist. What it might be: A tooth might become broken or chipped as a result of tooth decay, which weakens the tooth structure. Clenching, grinding, and external trauma can also cause teeth to become broken or chipped. In addition, sharp edges from a broken tooth can cause irritation to the tongue or cheek. What you should do: Avoid chewing on the affected side, rinse your mouth with saltwater, and see a dentist. What it might be: A tooth might become cracked as a result of tooth decay, which weakens the tooth structure. Clenching and grinding can also result in cracked teeth. What you should do: Avoid chewing on the affected side and see a dentist. What it might be: There are many health conditions that can cause jaw pain, including clenching, grinding and temporomandibular joint disorder (TMJ). Sometimes, pain from dental conditions that do not directly affect the jaw, such as tooth decay or an abscessed tooth, can radiate to the jaw. What you should do: Avoid opening your mouth widely or chewing on hard food, and see a dentist. In the meantime, you can also take an anti-inflammatory such as Advil, unless you are allergic. What it might be: Knocked-out teeth are generally the result of external trauma, such as sports injuries. It is also possible for a tooth to fall out due to severe gum disease. What you should do: Save the tooth, holding it by the crown (the smooth white part), and placing the tooth in milk or a saline solution such as contact lens solution. In addition, avoid chewing on the affected side, rinse your mouth with saltwater, and immediately see a dentist. If the tooth has become knocked-out as a result of a sports injury, you should wear a sportsguard in the future. What it might be: A crown might become lost or broken because there is tooth decay (a cavity) underneath the crown, or because the crown has become decemented. Other possible causes: a fractured tooth, clenching, grinding, or external trauma. What you should do: Save the crown, as it may be possible for the dentist to put it back on the tooth. Avoid chewing on the affected side, rinse your mouth with saltwater, and see a dentist. What it might be: A filling might become lost or broken because there is tooth decay (a cavity) underneath the filling, or because the filling has become debonded. Other possible causes: a fractured tooth, clenching, grinding, or external trauma. What it might be: A veneer might become lost or broken because there is tooth decay (a cavity) underneath the veneer, or because the veneer has become decemented. Other possible causes: a fractured tooth, clenching, grinding, or external trauma. What it might be: Pus drainage or a visible abscess means that the tooth or gum has become infected. Infections can be serious, since they can migrate to other parts of your body. What you should do: Rinse your mouth with saltwater and immediately see a dentist. What it might be: Teeth may become sensitive to cold as a result of rough brushing, clenching, or grinding. This rough treatment can cause a tooth to lose its protective enamel, and it also damages gums, exposing the tooth’s root. Cold sensitivity might also be caused by tooth decay, cracked teeth, or fallen-out fillings. What you should do: Place a pea-sized amount of sensitivity toothpaste on the affected area and see a dentist. What it might be: Heat sensitivity in a tooth may be a sign of nerve irritation or necrosis. It could also be a sign of deep tooth decay (a deep cavity). 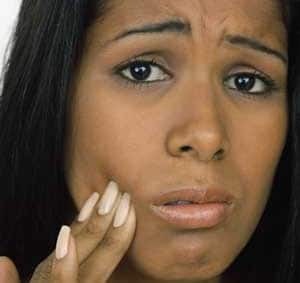 What it might be: A swollen face may indicate an infection in your tooth, gum or jawbone. Infections can be life-threatening, since they can migrate to another part of your body. What you should do: Stay upright (don’t lie flat) and drink fluids. Immediately see a dentist or go to your hospital emergency room. What it might be: If you feel that something is stuck between your teeth, it might be a food particle, a tooth fragment, or a broken filling. What you should do: Gently floss the area. If you still feel that something is not right, see a dentist. What it might be: An irritated tongue may be the result of physical trauma (for example, biting) or chemical trauma (for example, acidic food). It may also indicate a growth. What you should do: Rinse your mouth with saltwater and see a dentist. What it might be: A toothache may indicate a deep cavity, an infected nerve, a cracked tooth, or a broken tooth. Less commonly, toothaches (particularly in the upper back teeth) may be the result of a sinus infection. What you should do: Avoid chewing on the affected side, rinse your mouth with saltwater, and see a dentist. In the meantime, you can also take an anti-inflammatory such as Advil, unless you are allergic. If you live or work in downtown Toronto, you can call or email Adelaide Dental Clinic. The dentists there set aside time in their schedules for emergencies, and can usually see emergency patients on the same day.